2.4 INQUIRY into digital technology? Your personal inquiry into teaching and learning with digital technology will begin this week. You will pose a real question about the OSAPAC software you select to investigate. You will find resources, interpret information and report your findings. You will apply a variety of digital tools throughout the process and in presenting the final product. The tools you choose will be based on your own fluency with technology, making this a 'constructivist' learning task. If you have any questions about this task, please contact your instructor for clarification or guidance. 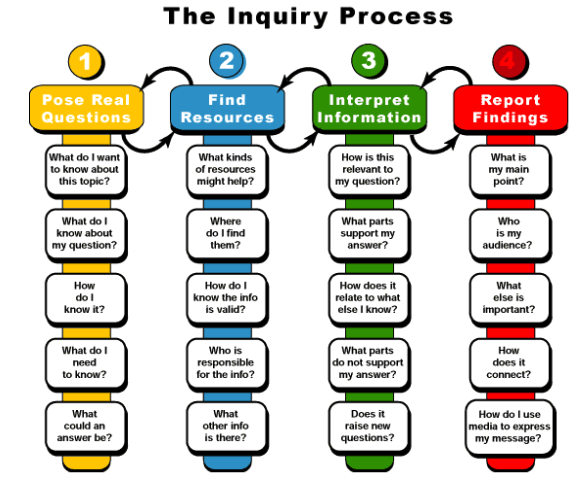 To further your understanding of the inquiry process, review the step-by-step guide presented on this web page "How to: Inquiry". By completing this task while applying the inquiry process, you will gain understanding that can be transferred to your own teaching practice. In this way, you will model digital age work and learning. Use the AACRT template posted to the right to collect and focus your inquiry. Keep in mind your inquiry question while gathering information about the software resource. Use the Web 2.0 tools suggested, or others that you have used for other purposes, to create a digital product that reports your findings in unique ways. Learn more about the inquiry process that these Canadian teachers have experienced in their efforts to provide inquiry learning for their students.